This innovative LL.M. program is designed to offer in-depth instruction on the critical issue of our time: the protection of human dignity across political, social, economic, and cultural lines. 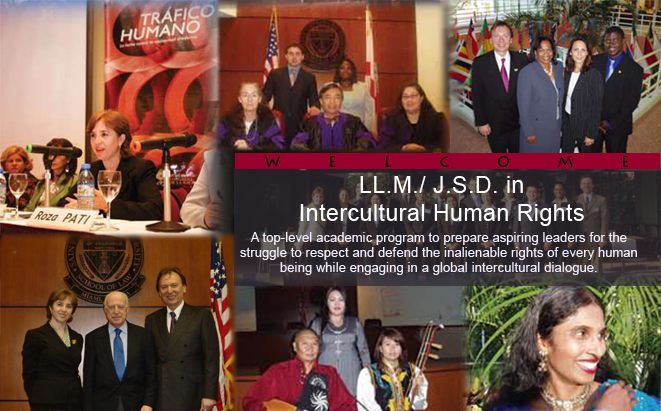 Lawyers, government officials, teachers, human rights activists, and businessmen and women with a commitment to human rights and social justice are invited to St. Thomas University School of Law in Miami to pursue an advanced degree in one of the most dynamic fields of international law: intercultural human rights. Professor Guy S. Goodwin-Gill, D.Phil. (Oxon. ), Professor of International Refugee Law (1998-2014) and Emeritus Fellow, All Souls College, Oxford University, U.K.
Students develop the ability to evaluate the major theories, practices, and fundamental concepts in international human rights law and policy, as well as to conduct effective research and advocacy in the field of human rights in a practical and interactive way. By now, the LL.M. Program in Intercultural Human Rights has graduated 400 students from 85 countries around the world and from all over the U.S. They are our ambassadors in the struggle for protection of human dignity, working with the United Nations Office of the High Commissioner for Human Rights, United Nations Volunteers, the United Nations High Commissioner for Refugees, the Council of Europe, the African Union, the International Organization for Migration, the World Bank, OXFAM, the Open Society Forum, the Parliamentarians for Global Action, the Red Cross, and others; successfully litigating cases in courts; working for governments and in academia; or running their own NGOs. The LL.M. degree is earned in one year upon completion of 24 academic credits. The program offers more than 20 mostly one-week, compact courses in intercultural human rights. Human rights law and complaint procedures, international law, humanitarian law, human rights and terrorism, human rights and the environment will all be addressed, as well as issues of refugees, women and children, indigenous peoples, religion, criminal law, and international trade. Our courses exploring theoretical issues and practical applications guarantee that the program, now over a decade old, continues to excel. Honors graduates of the LL.M. program are eligible to apply for admission into the Doctor of Science of Law program in Intercultural Human Rights. Enrollment for the LL.M. degree is open to holders of a Juris Doctor (J.D.) degree or similar foreign qualifications in the field of law. On a highly selective basis, admission may also be granted to holders of a bachelor's degree or its foreign equivalent, who have shown an outstanding commitment to the cause of human rights and human dignity. Non-lawyers participating in this program are advised that the program does not prepare or qualify its students to engage in the practice of law and that the program is not intended to qualify students to take a bar examination. Students may apply for full time or part-time status. A full-time student is defined as one who is enrolled in at least six credits in any one semester. Usually, students will be admitted as full-time students in order to complete the program in one academic year. Exceptionally, applicants may be admitted to the program as part-time students. Upon consultation with, and approval by, the Program Director, they may select their courses and complete them over a period of up to four years. Extensions of this period may be granted in unusual cases by the Dean of the School of Law. If changes to the curriculum occur during this period of time, the Program Director will determine, in consultation with the student, which classes of the amended LL.M. curriculum the student will have to enroll in in order to attain the full complement of 24 academic credits. Applicants may apply for admission on a rolling basis. Space is limited; in order to enhance their chances, we encourage prospective students to apply as early as possible. An applicant will receive an admissions decision within two weeks after the file has been completed. Upon admission, the students have to submit payment of a deposit of $300 to reserve their seat. This amount is credited toward the tuition for the students who enroll in the program, and it is forfeited for those who fail to do so. International students are charged a $200 SEVIS fee with the issuance of the I-20 form. International applicants see below for more detailed information. A current resume (curriculum vitae). Official transcripts from all college/university and/or certified foreign diplomas or certificates are to be sent directly from the issuing institution to St. Thomas University School of Law, LL.M. Program in Intercultural Human Rights. All foreign diplomas and transcripts should be translated into English and certified or notarized. All foreign credentials must be evaluated by an approved agency in the U.S. We recommend World Education Services or Josef Silny & Associates. Two recommendation letters, preferably one from your present employer and one from a professor. Two passport size photos [optional at this stage]. Interview in person or conference call. International students are defined as students in need of a student visa, i.e., not U.S. citizens or permanent residents. They have to fulfill the same admissions criteria as U.S. students. In addition, they have to receive an I-20 document from the University Office of International Students and pay a $200 SEVIS fee for the processing of the I-20 application. Also, they have to obtain proper student visa status prior to entering the country. They may work at the University (subject to availability) for a time not exceeding 20 hours a week and are eligible to apply for optional practical training subsequent to completion of their studies in the LL.M. program. Students interested in this latter option are advised to apply for USCIS approval as soon as possible after beginning their studies with the Director of the University's Office of International Students. For more information regarding Immigration and Visa applications, please visit St. Thomas University's International Student Services page. International students are especially encouraged to apply early, in order to proceed with the visa application in a timely manner. International applicants are encouraged to view the St. Thomas University Guide for International Students prior to submitting their completed application. The Master of Laws in Intercultural Human Rights degree program is completed in 24 credits over two semesters and offers a wide variety of courses for students to choose from. Nineteen of the 24 credits required for the LL.M. degree are required credits. In addition, students choose two seminar credits and three additional elective credits from a variety of international and comparative law courses, as well as other pertinent courses offered in the J.D. curriculum as recognized by the Director of the LL.M. Program. These courses include seminars such as The Rule of Law, International Law in the 21st Century, Natural Law, Comparative Law, Poverty Law and Economic Justice, Cybersecurity Law, Legal Storytelling, Sexual Identity and the Law, Canon Law, and Women and the Law, as well as courses such as Human Trafficking Law, Immigration Law, Family Law, Elder Law, Election Law, Health and Human Rights, Law and Literature, Law and Biomedicine, and Jurisprudence. The required courses are offered according to the current LL.M. course schedule. Students should review the law school course schedule to determine the seminars and elective courses currently offered.